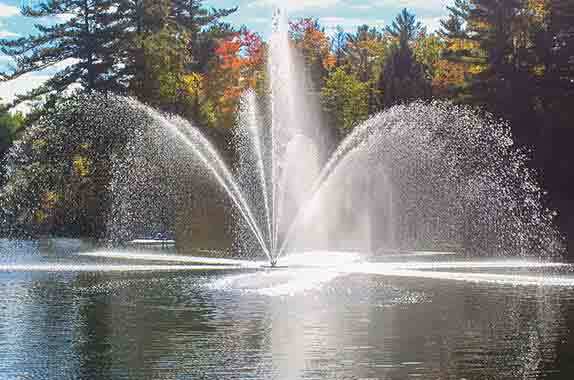 Arbrux offers municipalities a safe, reliable, and cost efficient line of floating fountains and pond aerators. You can expect clean and beautiful ponds, lakes, and marinas for your residents. Arbrux also offers de-icer/ bubbler units for municipal marinas to keep ice clear from docks and structures, preventing ice damage. Arbrux floating pond aerators move large volumes of water naturally; aerating city ponds, removing stagnant water, insects, algae, and foul odours. Arbrux pond and lake aerators work by propelling water into the air forming small droplets that absorb oxygen which aerates the water cleaning it in the process. Municipal uses for Arbrux aerators include civic property lakes, community ponds, retention ponds, and marinas. Arbrux aerating fountains (also known as lake fountains and floating fountains) serve as a city or park centerpiece and attractive visual feature to attract tourists and residents while providing aeration to keep the water clean. Arbrux aerating fountains come in a variety of sizes ranging from 6 to 46 feet in height, with 6 different spray patterns to choose from, there is sure to be an aerating fountain that is perfect for your municipality application. Arbrux de-icers/ bubblers remove ice from around marina docks and structures preventing ice damage. These cost effective units have been proven to last for years to come, even in the harshest Canadian and USA winters. De-icers/ bubblers operate by moving high volumes of water from the deeper warmer water to create an ice-free opening at the surface of the body of water. Each pond and lake fountain, aerator, and de-icer product conforms to current regulation safety standards and is electrically safety tested and listed with ETL to CSA and UL standards. For more information on our municipal line of products, contact an Arbrux expert or request a quote today!